I’m taking it a bit easier on gifts this year, due to still looking for work. So using what I have in the house, I’ve been making quite a few homemade gifts – of the culinary sort of course. Cookies, caramel sauce, and now seasoned salt. For those that like a bit of kick in their dishes, I thought a homemade spicy salt would be a nice treat. Something that most people wouldn’t buy for themselves, yet would use. 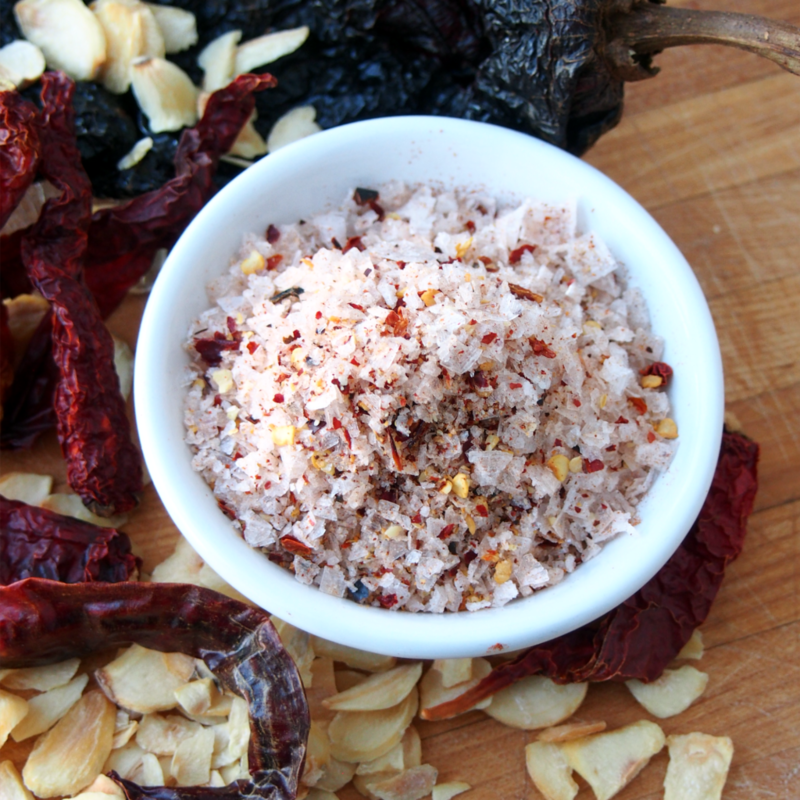 For this salt, I used a combination of chilies to give not only heat, but flavour. I also used some lovely Mediterranean sea salt flakes and kept them as is, instead of grinding them small. I picked up the dried garlic flakes in the recipe from a local Asian market. They pack a whollop of intense garlic taste. I used my coffee bean grinder to grind up the chilies and dried garlic flakes and a tip to clean your grinder after is to fill it with dry rice and give a whiz. Simply wipe it out after and the spicy odors and oils are gone, being absorbed into the rice. Remove the tops and some of the seeds from the kashmiri chilies and place in a spice / coffee grinder. Whiz to a small or fine flaked size. You will need 1 heaping tablespoon of the flakes. Remove the tops and some of the seeds from the adobo chili. Whiz the chili and garlic flakes to a small or fine flaked size. Combine chilies and garlic flakes in with the salt.